"Sikh" redirects here. For the Sikh religion, see Sikhism. Sikhs (/siːk/ or /sɪk/; Punjabi: ਸਿੱਖ, sikkh, [sɪkkʰ]) are people associated with Sikhism, a monotheistic religion that originated in the 15th century, in the Punjab region in the northern part of the Indian subcontinent, based on the revelation of Guru Nanak. The term "Sikh" has its origin in the Sanskrit words शिष्य (śiṣya), meaning a disciple or a student. A Sikh, according to Article I of the Sikh Rehat Maryada (the Sikh code of conduct), is "any human being who faithfully believes in One Immortal Being; ten Gurus, from Guru Nanak to Guru Gobind Singh; Guru Granth Sahib; the teachings of the ten Gurus and the baptism bequeathed by the tenth Guru". The Punjab region of the Indian subcontinent has been the historic homeland of the Sikhs, and was ruled by the Sikhs for significant parts of the 18th and 19th centuries. Today, the Punjab state in northwest India has a majority Sikh population, and sizeable communities of Sikhs exist around the world. Many countries, such as the United Kingdom, recognize Sikhs as a designated religion on their censuses. The American non-profit organization United Sikhs has sought to have Sikh included on the U.S. census as an ethnicity, arguing that Sikhs "self-identify as an 'ethnic minority'" and believe "that they are more than just a religion". Male Sikhs generally have "Singh" (Lion) as their middle or last name (not all Singhs are Sikhs), and female Sikhs have "Kaur" (Princess) as their middle or last name. Sikhs who have undergone the Khanḍe-kī-Pahul (the Sikh initiation ceremony) may also be recognized by the five Ks: Kesh, uncut hair which is kept covered, usually by a turban; Kara, an iron or steel bracelet; Kirpan, a sword tucked into a gatra strap or a kamal kasar belt; Kachehra, a cotton undergarment; and Kanga, a small wooden comb. Guru Nanak (1469–1539), founder of Sikhism, was born to Mehta Kalu and Mata Tripta, in the village of Talwandi, now called Nankana Sahib, near Lahore. Guru Nanak was a religious leader and social reformer. However, Sikh political history may be said to begin with the death of the fifth Sikh guru, Guru Arjan Dev, in 1606. Religious practices were formalised by Guru Gobind Singh on 30 March 1699. Gobind Singh initiated five people from a variety of social backgrounds, known as the Panj Piare (the five beloved ones) to form the Khalsa, or collective body of initiated Sikhs. During the period of Mughal rule in India (1556–1707) several Sikh gurus were killed by the Mughals for opposing their persecution of minority religious communities including Sikhs. Sikhs subsequently militarized to oppose Mughal rule. After defeating the Afghan and Mughal, sovereign states called Misls were formed, under Jassa Singh Ahluwalia. The Confederacy was unified and transformed into the Sikh Empire under Maharaja Ranjit Singh Bahadur, which was characterised by religious tolerance and pluralism, with Christians, Muslims and Hindus in positions of power. The empire is considered the zenith of political Sikhism, encompassing Kashmir, Ladakh and Peshawar. Hari Singh Nalwa, the commander-in-chief of the Sikh Khalsa Army in the North West Frontier, expanded the confederacy to the Khyber Pass. Its secular administration implemented military, economic and governmental reforms. After the annexation of the Sikh kingdom by the British, the latter recognized the martial qualities of the Sikhs and Punjabis in general and started recruiting from that area. During the 1857 Indian mutiny, the Sikhs stayed loyal to the British. This resulted in heavy recruiting from Punjab to the colonial army for the next 90 years of the British Raj. The distinct turban that differentiates a Sikh from other turban wearers is a relic of the rules of the British Indian Army. The British colonial rule saw the emergence of many reform movements in India including Punjab. This included formation in 1873 and 1879 of the First and Second Singh Sabha respectively. The Sikh leaders of the Singh Sabha worked to offer a clear definition of Sikh identity and tried to purify Sikh belief and practice. The later part of British colonial rule saw the emergence of the Akali movement to bring reform in the gurdwaras during the early 1920s. The movement led to the introduction of Sikh Gurdwara Bill in 1925, which placed all the historical Sikh shrines in India under the control of Shiromani Gurdwara Parbandhak Committee (SGPC). The months leading up to the partition of India in 1947 were marked by conflict in the Punjab between Sikhs and Muslims. This caused the religious migration of Punjabi Sikhs and Hindus from West Punjab, mirroring a similar religious migration of Punjabi Muslims from East Punjab. The 1960s saw growing animosity between Sikhs and Hindus in India, with the Sikhs demanding the creation of a Punjab state on a linguistic basis similar to other states in India. This was promised to Sikh leader Master Tara Singh by Jawaharlal Nehru, in return for Sikh political support during negotiations for Indian independence. Although the Sikhs obtained the Punjab, they lost Hindi-speaking areas to Himachal Pradesh, Haryana and Rajasthan. Chandigarh was made a union territory and the capital of Haryana and Punjab on 1 November 1966. Sikh leader Jarnail Singh Bhindranwale triggered violence in the Punjab. The prime minister Indira Gandhi ordered an operation to remove Bhindranwale from the Golden Temple in Operation Blue Star.This led to her assassination by her Sikh bodyguards. Gandhi's assassination resulted in an explosion of violence against Sikh communities and the killing of thousands of Sikhs throughout India. Since 1984, relations between Sikhs and Hindus have moved toward a rapprochement aided by economic prosperity. However, a 2002 claim by the Hindu right-wing Rashtriya Swayamsevak Sangh (RSS) that "Sikhs are Hindus" disturbed Sikh sensibilities. During the 1999 Vaisakhi, Sikhs worldwide celebrated the 300th anniversary of the creation of the Khalsa. Canada Post honoured Sikh Canadians with a commemorative stamp in conjunction with the 300th anniversary of Vaisakhi. On April 9, 1999, Indian president K.R. Narayanan issued a stamp commemorating the 300th anniversary of the Khalsa. In 2004, Manmohan Singh became the first Sikh Prime Minister of India, and first Sikh Head of Government in the world. One who calls himself a Sikh of the Guru, the True Guru, shall rise in the early morning hours and meditate on the Lord's Name. Upon arising early in the morning, he is to bathe, and cleanse himself in the pool of nectar. Following the Instructions of the Guru, he is to chant the Name of the Lord, Har, Har. All sins, misdeeds and negativity shall be erased. Then, at the rising of the sun, he is to sing Gurbani; whether sitting down or standing up, he is to meditate on the Lord's Name. One who meditates on my Lord, Har, Har, with every breath and every morsel of food - that GurSikh becomes pleasing to the Guru's Mind. That person, unto whom my Lord and Master is kind and compassionate - upon that GurSikh, the Guru's Teachings are bestowed. Servant Nanak begs for the dust of the feet of that GurSikh, who himself chants the Naam, and inspires others to chant it. Kachera: Cotton undergarments, historically appropriate in battle due to increased mobility when compared to a dhoti. Worn by both sexes, the kachera is a symbol of chastity. Kara: An iron bracelet, a symbol of eternity. Kirpan: An iron dagger in different sizes. In the UK Sikhs can wear a small dagger, but in the Punjab they might wear a traditional curved sword from one to three feet in length. The Sikhs have a number of musical instruments: the rebab, dilruba, taus, jori and sarinda. 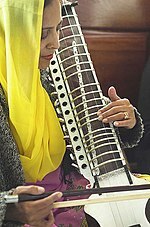 Playing the sarangi was encouraged by Guru Hargobind. The rebab was played by Bhai Mardana as he accompanied Guru Nanak on his journeys. The jori and sarinda were introduced to Sikh devotional music by Guru Arjan. 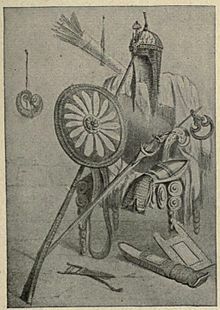 The taus was designed by Guru Hargobind, who supposedly heard a peacock singing and wanted to create an instrument mimicking its sounds (taus is the Persian word for peacock). The dilruba was designed by Guru Gobind Singh at the request of his followers, who wanted a smaller instrument than the taus. After Japji Sahib, all of the shabad in the Guru Granth Sahib were composed as raags. This type of singing is known as Gurmat Sangeet. When they marched into battle, the Sikhs would play a Ranjit Nagara (victory drum) to boost morale. Nagaras (usually two to three feet in diameter, although some were up to five feet in diameter) are played with two sticks. The beat of the large drums, and the raising of the Nishan Sahib, meant that the singhs were on their way. Numbering about 27 million worldwide, Sikhs make up 0.39% of the world population; approximately 83% live in India. About 76% of all Sikhs live in the north Indian State of Punjab, where they form a majority (about two-thirds) of the population. Substantial communities of Sikhs live in the Indian states or union territories of Chandigarh where they form 13.11% of the population, Haryana (more than 1.2 million), Rajasthan, West Bengal, Uttar Pradesh, Delhi, Maharashtra, Uttarakhand, Madhya Pradesh, Assam and Jammu and Kashmir. Sikh migration from British India began in earnest during the second half of the 19th century, when the British completed their annexation of the Punjab. The British Raj recruited Sikhs for the Indian Civil Service (particularly the British Indian Army), which led to Sikh migration throughout India and the British Empire. During the Raj, semiskilled Sikh artisans were transported from the Punjab to British East Africa to help build railroads. Sikhs emigrated from India after World War II, most going to the United Kingdom but many to North America. Some Sikhs who had settled in eastern Africa were expelled by Ugandan dictator Idi Amin in 1972. Economics is a major factor in Sikh migration, and significant communities exist in the United Kingdom, the United States, Malaysia, East Africa, Australia, Singapore and Thailand. Due to this, Canada is the country that has the highest number of Sikhs in proportion to the population in the world at 1.4% of Canada's total population. Map showing world Sikh population areas and historical migration patterns (2004 estimate). Although the rate of Sikh migration from the Punjab has remained high, traditional patterns of Sikh migration favouring English-speaking countries (particularly the United Kingdom) have changed during the past decade due to stricter immigration laws. Moliner (2006) wrote that as a consequence of Sikh migration to the UK "becom[ing] virtually impossible since the late 1970s", migration patterns evolved to continental Europe. Italy is a rapidly growing destination for Sikh migration, with Reggio Emilia and Vicenza having significant Sikh population clusters. Italian Sikhs are generally involved in agriculture, agricultural processing, the manufacture of machine tools and horticulture. Johnson and Barrett (2004) estimate that the global Sikh population increases annually by 392,633 (1.7% per year, based on 2004 figures); this percentage includes births, deaths and conversions. Primarily for socio-economic reasons, Indian Sikhs have the lowest adjusted growth rate of any major religious group in India, at 16.9% per decade (estimated from 1991 to 2001). The Sikh population has the lowest gender balance in India, with only 903 women per 1,000 men according to the 2011 Indian census. Guru Nanak in Sri Granth Sahib calls for treating everyone equally. [a] Other Sikh Gurus also denounced the hierarchy of the caste system. However they all came from just one caste, the Khatris. Despite that, social stratification exists in the Sikh community. Over 60% of Sikhs belong to the Jat caste which is an agrarian caste. Despite being very small in numbers, the mercantile Khatri and Arora castes wield considerable influence within the Sikh community. Other common Sikh castes include Sainis (kshatriyas), Rajputs, Ramgarhias (artisans), Ahluwalias (formerly brewers), Kambojs (rural caste), Rai Sikh (rural caste), Labanas (merchants), Kumhars and the two Dalit castes, known in Sikh terminology as the Mazhabis (the Chuhras) and the Ravidasias (the Chamars). According to Surinder Singh Jodhka, the Sikh religion does not advocate discrimination against any caste or creed, however, in practice, Sikhs belonging to the landowning dominant castes have not shed all their prejudices against the Dalit castes. While Dalits would be allowed entry into the village gurdwaras they would not be permitted to cook or serve langar (Communal meal). Therefore, wherever they could mobilise resources, the Sikh Dalits of Punjab have tried to construct their own gurdwara and other local level institutions in order to attain a certain degree of cultural autonomy. In 1953, Sikh leader, Master Tara Singh, succeeded in persuading the Indian Government to include Sikh castes of the converted untouchables in the list of scheduled castes. In the Shiromani Gurdwara Prabandhak Committee, 20 of the 140 seats are reserved for low-caste Sikhs. According to a 1994 estimate, Punjabis (Sikhs and non-Sikhs) comprised 10 to 15 percent of all ranks in the Indian Army, although the state contained less than 3% of the country's population. The Indian government does not release religious or ethnic origins of the military personnel, but a 1991 report by Tim McGirk estimated that 20 percent of Indian Army officers were Sikhs. Together with the Gurkhas recruited from Nepal, the Maratha Light Infantry from Maharashtra and the Jat Regiment, the Sikhs are one of the few communities to have exclusive regiments in the Indian Army. The Sikh Regiment is one of the most-decorated regiments in the army, with 73 Battle Honours, 14 Victoria Crosses, 21 first-class Indian Orders of Merit (equivalent to the Victoria Cross), 15 Theatre Honours, five COAS Unit Citations, two Param Vir Chakras, 14 Maha Vir Chakras, five Kirti Chakras, 67 Vir Chakras and 1,596 other awards. The highest-ranking general in the history of the Indian Air Force is a Punjabi Sikh, Marshal of the Air Force Arjan Singh. Plans by the United Kingdom Ministry of Defence for a Sikh infantry regiment were scrapped in June 2007. Historically, most Indians have been farmers and 66 percent of the Indian population are engaged in agriculture. Indian Sikhs are employed in agriculture to a lesser extent; India's 2001 census found 39 percent of the working population of the Punjab employed in this sector. The success of the 1960s Green Revolution, in which India went from "famine to plenty, from humiliation to dignity", was based in the Punjab (which became known as "the breadbasket of India"). The Punjab is the wealthiest Indian state per capita, with the average Punjabi income three times the national average. The Green Revolution centred on Indian farmers adopting more intensive and mechanised agricultural methods, aided by the electrification of the Punjab, cooperative credit, consolidation of small holdings and the existing, British Raj-developed canal system. According to Swedish political scientist Ishtiaq Ahmad, a factor in the success of the Indian green revolution was the "Sikh cultivator, often the Jat, whose courage, perseverance, spirit of enterprise and muscle prowess proved crucial". However, not all aspects of the green revolution were beneficial. Indian physicist Vandana Shiva wrote that the green revolution made the "negative and destructive impacts of science [i.e. the green revolution] on nature and society" invisible, and was a catalyst for Punjabi Sikh and Hindu tensions despite a growth in material wealth. Punjabi Sikhs are engaged in a number of professions which include science, engineering and medicine. Notable examples are nuclear scientist Piara Singh Gill (who worked on the Manhattan Project), fibre-optics pioneer Narinder Singh Kapany and physicist, science writer and broadcaster Simon Singh. In business, the UK-based clothing retailers New Look and the Thai-based Jaspal were founded by Sikhs. India's largest pharmaceutical company, Ranbaxy Laboratories, is headed by Sikhs. UK Sikhs have the highest percentage of home ownership (82 percent) of any religious community. UK Sikhs are the second-wealthiest (after the Jewish community) religious group in the UK, with a median total household wealth of £229,000. In Singapore Kartar Singh Thakral expanded his family's trading business, Thakral Holdings, into total assets of almost $1.4 billion and is Singapore's 25th-richest person. Sikh Bob Singh Dhillon is the first Indo-Canadian billionaire. The Sikh diaspora has been most successful in North America. Sikh intellectuals, sportsmen and artists include poet and Bollywood lyricist Rajkavi Inderjeet Singh Tulsi, writer Khushwant Singh, England cricketer Monty Panesar, former 400m runner Milkha Singh, Indian wrestler and actor Dara Singh, former Indian hockey team captains Ajitpal Singh and Balbir Singh Sr., former Indian cricket captain Bishen Singh Bedi, Harbhajan Singh (India's most successful off spin cricket bowler), Navjot Singh Sidhu (former Indian cricketer turned politician). Bollywood actresses include Neetu Singh, Simran Judge, Poonam Dhillon, Mahi Gill, Esha Deol, Parminder Nagra, Gul Panag, Mona Singh, Namrata Singh Gujral and director Gurinder Chadha, Parminder Gill. Sikhs have migrated worldwide, with a variety of occupations. The Sikh Gurus preached ethnic and social harmony, and Sikhs comprise a number of ethnic groups. Those with over 1,000 members include the Ahluwalia, Arain, Arora, Bhatra, Bairagi, Bania, Basith, Bawaria, Bazigar, Bhabra, Chamar, Chhimba, Darzi, Dhobi, Gujar, Jatt, Jhinwar, Kahar, Kalal, Kamboj, Khatri, Kumhar, Labana, Lohar, Mahtam, Mazhabi, Megh, Mirasi, Mochi, Mohyal, Nai, Rajput, Ramgarhia, Saini, Sansi, Sudh, Tarkhan, Kashyap Rajput. An order of Punjabi Sikhs, the Nihang or the Akalis, was formed during Ranjit Singh's time. Under their leader, Akali Phula Singh, they won many battles for the Sikh Confederacy during the early 19th century. French postcard depicting the arrival of the 15th Sikh Regiment in France during World War I; the bilingual postcard reads, "Gentlemen of India marching to chasten the German hooligans". Sikhs supported the British during the Indian Rebellion of 1857. By the beginning of World War I, Sikhs in the British Indian Army totaled over 100,000 (20 percent of the force). Until 1945 fourteen Victoria Crosses were awarded to Sikhs, a per-capita regimental record. In 2002 the names of all Sikh VC and George Cross recipients were inscribed on the monument of the Memorial Gates on Constitution Hill, next to Buckingham Palace. Chanan Singh Dhillon was instrumental in campaigning for the memorial. During World War I, Sikh battalions fought in Egypt, Palestine, Mesopotamia, Gallipoli and France. Six battalions of the Sikh Regiment were raised during World War II, serving in the Second Battle of El Alamein, the Burma and Italian campaigns and in Iraq and receiving 27 battle honours. Around the world, Sikhs are commemorated in Commonwealth cemeteries. In the last two world wars 83,005 turban wearing Sikh soldiers were killed and 109,045 were wounded fighting for the British Empire. During shell fire, they had no other head protection but the turban, the symbol of their faith. British people are highly indebted and obliged to Sikhs for a long time. I know that within this century we needed their help twice [in two world wars] and they did help us very well. As a result of their timely help, we are today able to live with honour, dignity, and independence. In the war, they fought and died for us, wearing the turbans. During the late 19th and early 20th centuries, Sikhs began to emigrate to East Africa, the Far East, Canada, the United States and the United Kingdom. In 1907 the Khalsa Diwan Society was established in Vancouver, and four years later the first gurdwara was established in London. In 1912 the first gurdwara in the United States was founded in Stockton, California. Since Sikhs (like many Middle Eastern men) wear turbans and keep beards, some people in Western countries have mistaken Sikh men for Muslim or Arabic and Afghan men since the September 11 attacks and the Iraq War. Several days after the 9/11 attacks Sikh Balbir Singh Sodhi was murdered by Frank Roque, who thought Sodhi was connected with al-Qaeda. CNN suggested an increase in hate crimes against Sikh men in the United States and the UK after the 9/11 attacks. Since Sikhism has never actively sought converts, the Sikhs have remained a relatively homogeneous ethnic group. The 3HO organisation claim to have inspired a moderate growth in non-Indian adherents of Sikhism. In 1998 an estimated 7,800 3HO Sikhs, known colloquially as ‘gora’ (ਗੋਰਾ) or ‘white’ Sikhs, were mainly centred around Española, New Mexico and Los Angeles, California. Sikhs and the Sikh American Legal Defense and Education Fund overturned a 1925 Oregon law banning the wearing of turbans by teachers and government officials. In an attempt to foster Sikh leaders in the Western world, youth initiatives by a number of organisations exist. The Sikh Youth Alliance of North America sponsors an annual Sikh Youth Symposium, a public-speaking and debate competition held in gurdwaras throughout the U.S. and Canada. There are a number of Sikh office holders in Canada. In the United States, the current U.S. Ambassador to the United Nations and former governor of South Carolina, Nikki Haley, was born and raised as a Sikh, but converted to Christianity after her marriage. She still actively attends both Sikh and Christian services. The Khalistan movement is a Sikh separatist movement, which seeks to create a separate country called Khalistān ("The Land of the Pure") in the Punjab region of South Asia to serve as a homeland for Sikhs. The territorial definition of the proposed country Khalistan consists of both the Punjab, India along with Punjab, Pakistan and includes parts of Haryana, Himachal Pradesh, Jammu and Kashmir, and Rajasthan. Khalistan movement began as an expatriate venture. In 1971, the first explicit call for Khalistan was made in an advertisement published in the New York Times by an expat Jagjit Singh Chohan. By proclaiming the formation of Khalistan he was able to collect millions of dollars from the Sikh diaspora.On 12 April 1980 he declared the formation of "National Council of Khalistan", at Anandpur Sahib. He declared himself as the President of the Council and Balbir Singh Sandhu as its Secretary General. In May 1980, Jagjit Singh Chauhan travelled to London and announced the formation of Khalistan. A similar announcement was made by Balbir Singh Sandhu, in Amritsar, who released stamps and currency of Khalistan. The inaction of the authorities in Amritsar and elsewhere was decried by Akali Dal headed by the Sikh leader Harchand Singh Longowal as a political stunt by the Congress(I) party of Indira Gandhi. With financial and political support of the Sikh diaspora the movement flourished in the Indian state of Punjab, which has a Sikh-majority population and reached its zenith in the late 1970s and 1980s when the secessionist movement caused large scale violence among the local population. Operation Blue Star was an Indian military operation carried out between 1 and 8 June 1984, ordered by Prime Minister Indira Gandhi to remove militant religious leader Jarnail Singh Bhindranwale and his armed followers from the buildings of the Harmandir Sahib complex in Amritsar, Punjab. In July 1983, the Sikh political party Akali Dal's President Harchand Singh Longowal had invited Bhindranwale to take up residence in Golden Temple Complex to evade arrest. Bhindranwale later on made the sacred temple complex an armoury and headquarters. In the violent events leading up to the Operation Blue Star since the inception of Akali Dharm Yudh Morcha, the militants had killed 165 Hindus and Nirankaris, even 39 Sikhs opposed to Bhindranwale were killed. The total number of deaths was 410 in violent incidents and riots while 1,180 people were injured. Casualty figures for the Army were 83 dead and 249 injured. According to the official estimate presented by the Indian government, 1592 were apprehended and there were 493 combined militant and civilian casualties. High civilian casualties were attributed to militants using pilgrims trapped inside the temple as human shields. Assassination of PM Indira Gandhi and bombing of Air India plane killing 328 passengers happened in that period. Various pro-Khalistan outfits have been involved in a separatist movement against the Government of India ever since. There are claims of funding from Sikhs outside India to attract young people into these pro-Khalistan militant groups. In January 1986, the Golden Temple was occupied by militants belonging to All India Sikh Students Federation and Damdami Taksal. On 26 January 1986, a gathering known as the Sarbat Khalsa (a de-facto parliament) passed a resolution (gurmattā) favouring the creation of Khalistan. Subsequently, a number of rebel militant groups in favour of Khalistan waged a major insurgency against the government of India. Indian security forces suppressed the insurgency in the early 1990s, but Sikh political groups such as the Khalsa Raj Party and SAD (A) continued to pursue an independent Khalistan through non-violent means. Pro-Khalistan organisations such as Dal Khalsa (International) are also active outside India, supported by a section of the Sikh diaspora. In the 1990s the insurgency petered out, and the movement failed to reach its objective due to multiple reasons including a heavy police crackdown on separatists, divisions among the Sikhs and loss of support from the Sikh population. Sikh art and culture are nearly synonymous with that of the Punjab, and Sikhs are easily recognised by their distinctive turban (Dastar). The Punjab has been called India's melting pot, due to the confluence of invading cultures from the rivers from which the region gets its name. Sikh culture is therefore a synthesis of cultures. Sikhism has forged a unique architecture, which S. S. Bhatti described as "inspired by Guru Nanak's creative mysticism" and "is a mute harbinger of holistic humanism based on pragmatic spirituality". During the Mughal and Afghan persecution of the Sikhs during the 17th and 18th centuries, the latter were concerned with preserving their religion and gave little thought to art and culture. With the rise of Ranjit Singh and the Sikh Raj in Lahore and Delhi, there was a change in the landscape of art and culture in the Punjab; Hindus and Sikhs could build decorated shrines without the fear of destruction or looting. The Sikh Confederacy was the catalyst for a uniquely Sikh form of expression, with Ranjit Singh commissioning forts, palaces, bungas (residential places) and colleges in a Sikh style. Sikh architecture is characterised by gilded fluted domes, cupolas, kiosks, stone lanterns, ornate balusters and square roofs. A pinnacle of Sikh style is Harmandir Sahib (also known as the Golden Temple) in Amritsar. Sikh culture is influenced by militaristic motifs (with the Khanda the most obvious), and most Sikh artifacts—except for the relics of the Gurus—have a military theme. This theme is evident in the Sikh festivals of Hola Mohalla and Vaisakhi, which feature marching and displays of valor. 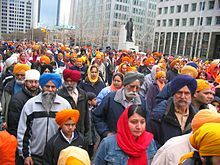 Although the art and culture of the Sikh diaspora have merged with that of other Indo-immigrant groups into categories like "British Asian", "Indo-Canadian" and "Desi-Culture", a minor cultural phenomenon which can be described as "political Sikh" has arisen. The art of diaspora Sikhs like Amarjeet Kaur Nandhra and Amrit and Rabindra Kaur Singh (the "Singh Twins") is influenced by their Sikhism and current affairs in the Punjab. Bhangra and Giddha are two forms of Punjabi folk dancing which have been adapted and pioneered by Sikhs. Punjabi Sikhs have championed these forms of expression worldwide, resulting in Sikh culture becoming linked to Bhangra (although "Bhangra is not a Sikh institution but a Punjabi one"). Sikh painting is a direct offshoot of the Kangra school of painting. In 1810, Ranjeet Singh (1780–1839) occupied Kangra Fort and appointed Sardar Desa Singh Majithia his governor of the Punjab hills. In 1813 the Sikh army occupied Guler State, and Raja Bhup Singh became a vassal of the Sikhs. With the Sikh kingdom of Lahore becoming the paramount power, some of the Pahari painters from Guler migrated to Lahore for the patronage of Maharaja Ranjeet Singh and his Sardars. The Sikh school adapted Kangra painting to Sikh needs and ideals. Its main subjects are the ten Sikh gurus and stories from Guru Nanak's Janamsakhis. The tenth Guru, Gobind Singh, left a deep impression on the followers of the new faith because of his courage and sacrifices. Hunting scenes and portraits are also common in Sikh painting. ^ "Sikhism". Encyclopædia Britannica. Retrieved 7 August 2018. ^ "Census of India". Retrieved 4 April 2008. ^ "Sikhs express shock after shootings at Wisconsin temple". BBC News. 6 August 2012. Retrieved 6 August 2012. ^ Khyati Y. Joshi (2006). The Racialization of Hinduism, Islam, and Sikhism in the United States. ^ "2011 National Household Survey". Statistics Canada. 8 May 2013. Retrieved 12 May 2013. ^ "Table QS210EW 2011 Census: Religion (Detailed), local authorities in England and Wales". Office for National Statistics. 11 December 2012. Retrieved 8 April 2017. ^ "Religion (detailed): All people" (PDF). National Records of Scotland. Retrieved 8 April 2017. ^ "Religion - Full Detail: QS218NI". Northern Ireland Statistics and Research Agency. Retrieved 8 April 2017. ^ Massimo Introvigne, Pierluigi Zoccatelli. "Il pluralismo religioso italiano nel contesto postmoderno". CESNUR's 2016 demographic report of minority religions in Italy. ^ "Census of Population and Housing: Reflecting Australia - Stories from the Census, 2016". Australian Bureau of Statistics. 28 June 2017. Retrieved 5 March 2018. ^ "Malaysia - Religion". Michigan State University. Archived from the original on 9 August 2011. Retrieved 24 November 2018. ^ "2006 Sikh Population". Retrieved 26 September 2012. ^ Rana, Yudhvir. "Pak NGO to resolve issues of Sikh community". The Times Of India. Retrieved 29 January 2011. ^ "Dubai's Sikh temple feeds the masses". The National (Abu Dhabi). 9 April 2014. Retrieved 21 March 2015. ^ "Punjabi community involved in money lending in Philippines braces for 'crackdown' by new President". 18 May 2016. ^ "2011 Gurdwara Philippines: Sikh Population of the Philippines". Archived from the original on 1 December 2011. Retrieved 11 June 2011. ^ "2013 Census QuickStats about culture and identity". Statistics New Zealand. Retrieved 12 November 2016. ^ Iyer, Raman. "Sikhs in Singapore: Turbanators with rich tradition of donning uniform". Retrieved 9 March 2011. ^ Jacobsen, Knut A.; Kværne, Per; Kristiansen, Knut (2018-02-20). "sikhisme". snl.no. Store norske leksikon. Retrieved 2019-04-13. I Norge bor det rundt 5000 sikher. ^ Nikky-Guninder Kaur Singh (22 February 2011). Sikhism: An Introduction. I.B.Tauris. pp. 61–. ISBN 978-0-85773-549-2. ^ Singh, Khushwant (2006). The Illustrated History of the Sikhs. India: Oxford University Press. p. 15. ISBN 0-19-567747-1. ^ (in Punjabi) Nabha, Kahan Singh (1930). ਗੁਰ ਸ਼ਬਦ ਰਤਨਾਕਰ ਮਹਾਨ ਕੋਸ਼ [Gur Shabad Ratnakar Mahan Kosh] (in Punjabi). p. 720. Archived from the original on 18 March 2005. Retrieved 29 May 2006. ^ "Sikh Reht Maryada: Sikh Code of Conduct and Conventions". Shiromani Gurdwara Parbandhak Committee. Archived from the original on 10 October 2008. Retrieved 6 November 2008. .
^ "Religion in England and Wales 2011". Retrieved 24 November 2018. ^ "Memorandum Regarding the Tabulation of Sikh Ethnicity in the United States Census" (PDF). Retrieved 20 November 2014. ^ Singh, Khushwant (2006). The Illustrated History of the Sikhs. India: Oxford University Press. pp. 12–13. ISBN 0-19-567747-1. ^ "BBC History of Sikhism – The Khalsa". Sikh world history. BBC Religion & Ethics. 29 August 2003. Retrieved 4 April 2008. ^ Singh, Patwant (2000). The Sikhs. Knopf. p. 14. ISBN 0-375-40728-6. ^ McLeod, Hew (1987). "Sikhs and Muslims in the Punjab". South Asia: Journal of South Asian Studies. 22 (s1): 155–165. doi:10.1080/00856408708723379. ^ Lafont, Jean-Marie (16 May 2002). Maharaja Ranjit Singh: Lord of the Five Rivers (French Sources of Indian History Sources). USA: Oxford University Press. pp. 23–29. ISBN 0-19-566111-7. ^ Ballantyne, Tony (2006). Between Colonialism and Diaspora: Sikh Cultural Formations in an Imperial World. United states: Duke University Press. p. 66. Retrieved 21 January 2015. ^ Cohn, Bernard S (1996). Colonialism and Its Forms of Knowledge: The British in India. Princeton, New Jersey, USA: Princeton University Press. pp. 107–109. Retrieved 26 January 2015. ^ Oberoi, Harjot (1994). The Construction of Religious Boundaries: Culture, Identity, and Diversity in the Sikh Tradition. University of Chicago Press. p. 494. ISBN 9780226615929. Retrieved 2013-09-18. ^ Nesbitt, Eleanor (2005). Sikhism : a very short introduction ([Online-Ausg.]. ed.). Oxford: Oxford University Press. ISBN 0-19-280601-7. Retrieved 14 January 2016. ^ Lukas, J. Anthony (20 March 1966). "Hindu vs. Sikh: Why the Killing". The New York Times. p. 209. ^ Telford, Hamish (November 1992). "The Political Economy of Punjab: Creating Space for Sikh Militancy". Asian Survey. 32 (11): 969–987. doi:10.1525/as.1992.32.11.00p0215k. JSTOR 2645265. ^ Pace, Eric (1 November 1984). "Assassination in India: Sikhs at the centre of the drama; Sikh separation dates back to '47". The New York Times. p. 24. ^ Rambachan, Anantanand. "The Co-existence of Violence and Non-Violence in Hinduism" (PDF). The Ecumenical Review. 55: 2003. Archived from the original (PDF) on 26 February 2008. Retrieved 4 April 2008. ^ "Canada Post to honour Sikh Canadians with a commemorative stamp". Tribune India. The Tribune. Retrieved 26 March 2013. ^ "Sri Guru Granth Sahib Translation". Sikhs.org. p. 305. Retrieved 29 January 2016. ^ Nesbitt, Eleanor (2005). Sikhism: a very short introduction. Oxford University Press. pp. 40–43. ISBN 0-19-280601-7. ^ "CIA Factbook". Retrieved 4 April 2008. ^ Sikhs in Punjab. Globalsecurity.org. Retrieved on 6 October 2011. ^ "Breakdown of Indian Sikh population by Indian States/Union territories". Retrieved 4 April 2008. ^ "Sikhism". Encyclopædia Britannica. Encyclopædia Britannica. 2007. http://www.britannica.com/eb/article-253167/Sikhism. ^ Canada, Government of Canada, Statistics. "The Daily — 2011 National Household Survey: Immigration, place of birth, citizenship, ethnic origin, visible minorities, language and religion". www.statcan.gc.ca. ^ Johnson, Todd; David B. Barrett (2 September 2004). "Quantifying Alternate Futures of Religion and Religions". Futures. 36 (9): 947–960. doi:10.1016/j.futures.2004.02.009. Retrieved 4 April 2008. ^ Moliner, Christine (2006). "Sikhs in France". Migration Patterns – Workshop on Indian Migration. Ecole des Hautes Etudes en Sciences Sociales (EHESS): Laboratoire d’Anthropologie Urbaine/CNRS. abstract. Archived from the original on 17 November 2006. ^ Ciprani, Ralph (14 May 2006). "Sikh Storia e immigrazione – The Sikhs: History and Immigration". International Sociology. 21 (3): 474–476. doi:10.1177/026858090602100331. Archived from the original on 10 April 2008. Retrieved 4 April 2008. ^ IANS (15 September 2004). "Now, Sikhs do a Canada in Italy". NRIinternet. Retrieved 4 April 2008. ^ Singh, Kulwinder (11 August 2007). "Italy may open VISA office in Chandigarh very soon". NRIinternet. Retrieved 4 April 2008. ^ "Proportion and growth rate of population by religious communities, India, 1961–2001" (PDF). Office of the Registrar General, India. CensusIndia. 6 September 2004. Archived from the original (PDF) on 27 September 2007. Retrieved 4 April 2008. ^ Singh Khalsa, Dr. Sant. "Sri Guru Granth Sahib Translation, p. 2". www.Srigranth.org. Srigranth.org. Retrieved 10 January 2017. ^ Singh Khalsa, Dr. Sant. "Sri Guru Granth Sahib Translation, p. 15". www.srigranth.org. Srigranth.org. Retrieved 10 January 2017. ^ Singh Khalsa, Dr. Sant. "Sri Guru Granth Sahib Translation, p. 278". www.srigranth.org. Srigranth.org. Retrieved 10 January 2017. ^ Oberoi, Harjot (1994). The construction of religious boundaries : culture, identity, and diversity in the Sikh tradition. Chicago: Oxford. p. 109. ISBN 978-0226615936. Retrieved 15 January 2017. ^ "Sikhism | History, Doctrines, Practice, & Literature". Encyclopedia Britannica. Retrieved 2017-12-26. ^ Jodhka, Surinder S (May 11–17, 2002). "Caste and Untouchability in Rural Punjab". Economic and Political Weekly. 37 (19): 1822. JSTOR 4412102. ^ a b "The Scheduled Castes in the Sikh Community – A Historical Perspective". ^ a b Harish K. Puri (2004). Dalits in Regional Context. ISBN 978-81-7033-871-0. ^ Puri, H.K (2003). "Scheduled castes in Sikh community: A historical perspective". Economic and Political Weekly. 38 (26(Jun. 28 - Jul. 4, 2003)): 2693–2701. JSTOR 4413731. ^ a b Kundu, Apurba (Spring 1994). "The Indian Armed Forces' Sikh and Non-Sikh Officers' Opinions of Operation Blue Star". Pacific Affairs. 67 (1): 48–49. doi:10.2307/2760119. JSTOR 2760119. ^ "Sikh Regiment". Retrieved 4 April 2008. ^ a b "Excerpts from British High Commissioner Michael Arthur, talk". Retrieved 4 April 2008. ^ "History of Sikh gallantry". The Daily Telegraph. London. 24 June 2007. Retrieved 4 April 2008. ^ Pillarisetti, Jagan. "Marshal of the Air Force Arjan Singh". Archived from the original on 27 March 2008. Retrieved 4 April 2008. ^ Rayment, Sean (24 June 2007). "Sikh regiment dumped over 'racism' fears". Telegraph. London. ^ "World Bank loan for India farmers". BBC NEWS. 27 June 2007. Retrieved 4 April 2008. ^ "Agriculture and Allied Sector". Economy and Infrastructure. Punjab State. Archived from the original on 10 March 2008. Retrieved 4 April 2008. ^ "Census 2001, data". Government of India. November 2002. Retrieved 9 September 2010. ^ "Welcome to Official Web site of Punjab, India". Archived from the original on 18 March 2008. Retrieved 4 April 2008. ^ "India's "breadbasket" aims to be new IT hotspot". Reuters. 30 April 2007. Retrieved 4 April 2008. ^ "Where Punjab Leads". Archived from the original on 23 March 2008. Retrieved 4 April 2008. ^ "The Green Revolution". Agriculture. Punjab State. 2004. Archived from the original on 30 March 2008. Retrieved 4 April 2008. ^ Ishtiaq, Ahmad (8 February 2005). "West and East Punjab agriculture: a comparison". Comment. Daily Times. Retrieved 4 April 2008. ^ Guus Geurts Studentnummer (5 March 2001). "The cause and effects of the Green Revolution in Punjab (India) – critical analysis of "The Violence of the Green Revolution" by Vandana Shiva (1991)" (MS Word). Katholieke Universiteit Nijmegen. ^ "JASPAL". About. Retrieved 4 April 2008. ^ "#24 Malvinder & Shivinder Singh". India's Richest. Forbes.com. 16 November 2006. Retrieved 4 April 2008. ^ "Housing: Sikhs most likely to own their own homes". Religion. UK National Statistics. 11 October 2004. Archived from the original on 26 February 2008. Retrieved 4 April 2008. ^ "An Anatomy of Economic Inequality in the UK" (PDF). Report of the National Equality Panel. The London School of Economics – The Centre for Analysis of Social Exclusion. 29 January 2010. Retrieved 1 February 2010. ^ "#25 Kartar Singh Thakral". Singapore's 40 Richest. Forbes.com. 24 August 2006. Retrieved 4 April 2008. ^ Kennedy Trevaskis, Hugh (1928). The Land of Five Rivers: An Economic History of the Punjab from Earliest Times to the Year of Grace 1890. London: Oxford University Press. pp. 216–217. ^ "Memorial Gates Official Website". Retrieved 4 April 2008. ^ "UK Government Report on the memorial". Archived from the original on 6 December 2008. Retrieved 4 April 2008. ^ "India's High Commission in London 'Sikhs pioneered Britain's multi-cultural society". Retrieved 4 April 2008. ^ Hansra, Harkirat (2007). Liberty at Stake: Sikhs: The Most Visible, Yet Misunderstood, Minority of America. iUniverse. p. 59. ISBN 9780595432226. ^ a b "Hate crime reports up in wake of terrorist attacks". US News. CNN. 17 September 2001. Archived from the original on 15 April 2008. Retrieved 4 April 2008. ^ a b "Sikhs urging action on faith hate". UK News. BBC News. 5 November 2006. Retrieved 4 April 2008. ^ "3HO Healthy Happy Holy Organisation". About 3HO. 3HO.org. Retrieved 4 April 2008. ^ "Table of religious groups by alphabetical order". Adherents.com. 23 April 2007. Retrieved 4 April 2008. ^ Sikh Teachers Are Now Able to Teach in Oregon Public Schools « SALDEF. Saldef.org (2 April 2010). Retrieved on 6 October 2011. ^ Kinnvall, Catarina (2007-01-24). Globalization and Religious Nationalism in India. books.google.com. ISBN 9781134135707. ^ Crenshaw, Martha (1995). Terrorism in Context. Pennsylvania State University. p. 364. ISBN 978-0-271-01015-1. ^ The foreign policy of Pakistan: ethnic impacts on diplomacy, 1971-1994 ISBN 1-86064-169-5 - Mehtab Ali Shah "Such is the political, psychological and religious attachment of the Sikhs to that city that a Khalistan without Lahore would be like a Germany without Berlin." ^ Amritsar to Lahore: A Journey Across the India-Pakistan Border - Stephen Alter ISBN 0-8122-1743-8 "Ever since the separatist movement gathered force in the 1980s, Pakistan has sided with the Sikhs, the territorial ambitions of Khalistan have at times included Chandigarh, sections of the Indian Punjab, including whole North India and some parts of western states of India." ^ Pruthi, Raj (2004). Sikhism and Indian Civilization. Discovery Publishing House. p. 169. ISBN 9788171418794. Retrieved 25 October 2018. ^ Van Dyke 2009, p. 976. ^ Haresh Pandya (11 April 2007). "Jagjit Singh Chauhan, Sikh Militant Leader in India, Dies at 80". The New York Times. Retrieved 28 August 2008. ^ Nayar, Kuldip; Kushwant Singh (1985). Tragedy of Punjab. Vision Books. p. 51. ISBN 1-85127-069-8. ^ Singh, Satinder (1982). Khalistan: An Academic Analysis. Delhi & Punjab: Amar Prakashan. p. 114. ^ Swami, Praveen (16 January 2014). "RAW chief consulted MI6 in build-up to Operation Bluestar". Chennai, India: The Hindu. Retrieved 31 January 2014. ^ Khushwant Singh, A History of the Sikhs, Volume II: 1839-2004, New Delhi, Oxford University Press, 2004, p. 337. ^ "Operation Blue Star: India's first tryst with militant extremism - Latest News & Updates at Daily News & Analysis". Dnaindia.com. 5 November 2016. Archived from the original on 3 November 2017. Retrieved 29 October 2017. ^ "Sikh Leader in Punjab Accord Assassinated". LA Times. Times Wire Services. 21 August 1985. Archived from the original on 29 January 2016. Retrieved 14 June 2018. ^ Mark Tully, Satish Jacob (1985). "deaths+in+violent" Amritsar; Mrs. Gandhi's Last Battle (e-book ed.). London. p. 147, Ch. 11. ^ "Army reveals startling facts on Bluestar". Tribune India. 30 May 1984. Archived from the original on 5 July 2009. Retrieved 9 August 2009. ^ White Paper on the Punjab Agitation. Shiromani Akali Dal and Government of India. 1984. p. 169. Archived from the original on 15 July 2018. Retrieved 15 July 2018. ^ Kiss, Peter A. (2014). Winning Wars amongst the People: Case Studies in Asymmetric Conflict (Illustrated ed.). Potomac Books. p. 100. ISBN 9781612347004. Archived from the original on 15 July 2018. Retrieved 15 July 2018. ^ "Jagmeet Singh now rejects glorification of Air India bombing mastermind" (The 18-month long Air India inquiry, led by former Supreme Court justice John Major, pointed to Parmar as the chief terrorist behind the bombing. A separate inquiry, carried out by former Ontario NDP premier and Liberal MP Bob Rae, also fingered Parmar as the architect of the 1985 bombing that left 329 people dead 268 of them Canadians.). CBC News. 15 March 2018. Retrieved 30 April 2018. ^ "Sikh separatists 'funded from UK'". BBC. 4 March 2008. Retrieved 28 August 2008. ^ "Amnesty International report on Punjab". Amnesty International. 20 January 2003. Archived from the original on 3 December 2006. Retrieved 11 January 2010. ^ "The Tribune, Chandigarh, India - Punjab". Tribuneindia.com. Retrieved 2015-09-27. ^ "SAD (A) to contest the coming SGPC elections on Khalistan issue: Mann". PunjabNewsline.com. 14 January 2010. Archived from the original on 15 July 2011. Retrieved 22 January 2010. ^ Punj, Balbair (16 June 2005). "The Ghost of Khalistan". Sikh Times. Retrieved 11 January 2010. ^ "India gives Trudeau list of suspected Sikh separatists in Canada". Reuters, The Sikh insurgency petered out in the 1990s. He told state leaders his country would not support anyone trying to reignite the movement for an independent Sikh homeland called Khalistan. Retrieved 22 May 2018. ^ "New brand of Sikh militancy: Suave, tech-savvy pro-Khalistan youth radicalised on social media". Hindustan Times. Retrieved 27 April 2018. ^ "The Magnificence of Sikh Architecture". Archived from the original on 14 December 2007. Retrieved 4 April 2008. ^ Sian, Katy (2013). Unsettling Sikh and Muslim Conflict: Mistaken Identities, Forced Conversions, and Postcolonial Formations. Rowman & Littlefield. p. 32. ISBN 9780739178744. ^ Srivastava, RP (1983). Punjab Painting: Study in Art and Culture. Abhinav Publications. p. 13. ISBN 9788170171744. ^ "'Art and Culture of the Diaspora'". Retrieved 4 April 2008. ^ "Singh Twins Art Launches Liverpool Fest". Retrieved 4 April 2008. ^ "Bhangra & Sikhi by Harjinder Singh". Retrieved 4 April 2008. The Sikhs of the Punjab by J. S. Grewal. Published by Cambridge University Press (28 October 1998). ISBN 0-521-63764-3. Glory of Sikhism by R. M. Chopra, Sanbun Publishers, 2001, OCLC 499896556, Glory of Sikhism at Google Books. A Study of Religions by R. M. Chopra, Anuradha Prakashan, New Delhi, 2015. ISBN 978-93-82339-94-6. Look up Sikh in Wiktionary, the free dictionary. Wikimedia Commons has media related to Sikhs.